When you are comfortable, the surgeon makes a small incision in the gum tissue to reveal the bone, creates space using special instruments, and gently inserts the titanium implant. The top of this implant (called a healing abutment) is often visible through the gum. Sometimes it is better in the early stages of healing to have the implant covered by the gum tissue. The length of time varies from person to person, depending upon the quality and quantity of bone. In some cases, implants may be restored immediately after they are placed. The surgeon will advise you on follow-up care and timing. After the initial phase of healing, the surgeon places a healing abutment onto the implant (if not placed at time of initial surgery), during a brief follow-up appointment. 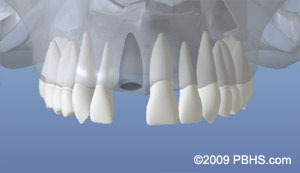 This allows the gum tissue to mature and provides access to the implant fro restorative procedures.. It may be beneficial to perform a soft tissue graft to obtain stronger, more easily cleaned and natural appearing gum tissue in the area around the implant. This process involves moving a small amount of gum tissue from one part of your mouth to the area around the implant. Your surgeon will make a determination of whether this is necessary, usually prior to implant placement. Most often, it is a brief and relatively comfortable procedure. Implants are often placed several months after extraction. At times, an implant may be placed immediately after extraction of a tooth. This may involve a little more risk, but it simplifies the process—you won’t have to wait for another appointment to place the implant. When infection or other problems with the bone are present, immediate implant placement is not the best treatment. As a general rule, Dr. Stewart and Dr. Michael feel that placing implants at the time of extraction is the best option, when possible. If your tooth has been missing for some time, the adjacent support bone is likely to grow thinner and shrink. This occurs because the root of the natural tooth has to be present to stimulate the bone. As much as one third of your jaw’s thickness can be lost in the year following tooth extraction! If you are missing enough bone, you may benefit from having additional bone grafted into the area. This ensures the implant will be adequately supported when it is placed in the jaw. Most frequently, one implant per missing tooth is placed. Because many of the larger teeth in the back of your jaws have two or three roots, the most common approach is to replace missing back teeth with larger implants. 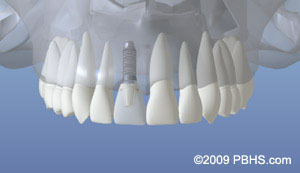 With advances in dental implant technology, often it is not necessary to replace each individual tooth with an implant.